Mini media player connects to a TV monitor (customer supplied) to create dynamic digital sign presentations. Load photos or videos onto a USB device & plug it into the HD media player. Remote control for effortless navigation through the menu. Buy an HDMI cable separately for better HD quality. Background music can play during a slideshow! This device is not compatible with MAC computers. This digital signage media player allows users to display dynamic presentations that are both entertaining and informative. 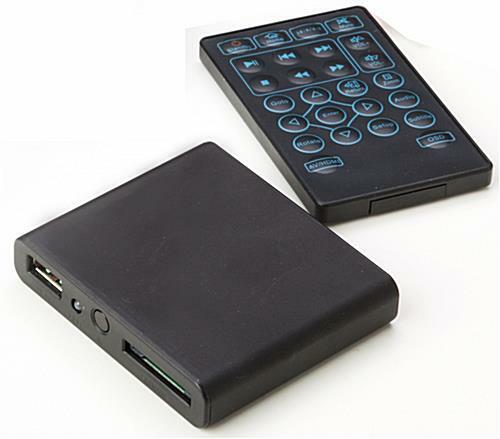 The simple, plug-n-play device is capable of presenting full-screen image slideshows and videos on practically any monitor. This basic digital signage media player, also known as an e-poster display, connects to a television using the included composite cables. For optimum results, an HDMI cable (sold separately) should be used. 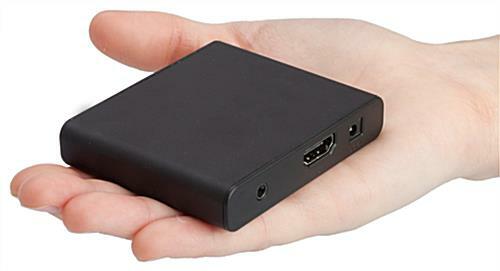 The plug-n-play digital signage HD media player plays media files from a USB storage device. Simply load advertising or informational images and movies onto a flash drive and connect it to the box. The digital sign media player that plays files from a USB stick does not require an Internet connection to work. There is no centralized content management interface or monthly subscription fee! This digital sign media player that includes a remote control measures only 2-9/16" x 3" x 9/16". The small-size unit can therefore easily be hidden below a monitor or within a TV stand or cabinet. We suggest using hook and loop strips to attach the device to the bottom or to the backside. This HD media player that is incredibly easy to set up and use is limited only by the amount of storage space on the USB drive being used. When displaying a slideshow, the plug-n-play electronic poster device provides a user with different transitional options in-between slides. The speed of each movement is also adjustable. The digital signage media player works in a wide variety of locations, including retail stores, hotel lobbies, restaurant foyers and universities. Why not use the device to communicate upcoming events or sales or special menu items? 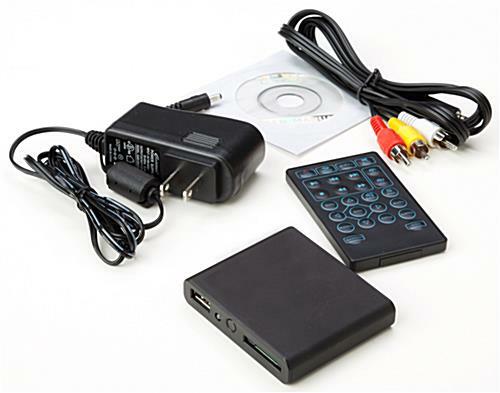 This HD media player takes only minutes to get ready and is simple to refresh and change at any time. To set up the displayer, simply load image, video or music files onto a USB flash drive. Next, plug the storage unit into the digital sign media player, which should already be connected to a monitor using the provided composite cables or an HDMI cord (sold separately.) Turn the device on using the provided remote control and make sure your TV is set to the right inputs. A menu screen should appear, showing a few different file-type options. To display a slideshow presentation, a user must first select this option, and then choose the source from which those files are stored. The digital signage media player is also capable of presenting movies and photos from an SD card. Once the right file is selected, the slideshow will begin to play. The HD media player offers the ability to alter the length of time each slide remains on a screen. Choose between 1, 3, 5 or 10 seconds. This digital sign media player also provides a user with a choice of transition styles: Persian Blinds Vertical, Persian Blinds Horizontal, Mosaic and Random. In addition to displaying simple slideshows, the electronic signage device can present music and slides at the same time! The first step is to navigate to the main menu and select the audio option. Select the folder of files to start playback. 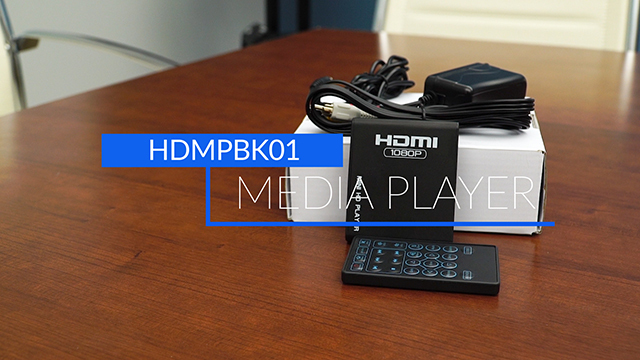 The HD media player will begin to play music instantly. It is recommended that these files be put in a loop cycle. Once this is completed, navigate back to the main menu and set up the image slideshow as directed before. It's that simple! Please Note: In order to add new presentations, a user must remove the USB external storage device, load the presentation and then plug it back into the unit. The USB must remain plugged into the player for image/video playback. This system does not play PowerPoint presentations; however, a user can save each slide as a .jpg and add it to the USB flash drive to run as a slide show. Customers must supply their own monitor or television. To use the included AV cable, versus an HDMI cable (not included) simply press the AV/HDMI button on the included remote. Please Note: This device is not compatible with MAC computers. 2.6" x 78.0" x 0.6"
I ordered two of these for my bowling center, one in 2015 and one in 2016. I use one as a menu board with about 5 rotating screens that have our open bowling pricing and food menu and a second one is an honor board to recognize those who have scored high games or a high series during bowling leagues. They work great and do exactly as they are supposed to! No bad review here! Ordered several media players for digital screens at our business, now trying to source a replacement because all players are going out one-by-one after only a couple of years. I suggest investing slightly more in a media player that will last more than 2 years. Hi Matthew, We're sorry to hear you're having trouble with your units. One of our customer care specialists will reach out shortly to assist! I was looking for a way to present a series of marketing slides for a trade show without hooking up a laptop to 32" computer monitors. The HDMPBK01 worked out perfectly. I am going to order several more. I purchased this device in May 2016. Very difficult to work with. Poor instructions. Not user friendly. Very limited functions. I have found Displays2Go to be a great company but this is an inferior product that they should discontinue selling. We always try to provide our customers with the best quality product and we are sorry that this item did not live up to our standards or your expectations, Shandon. A team member from our customer service department will reach out to you promptly to resolve your issue. We are sorry that you had some problems with your order, Peter. A customer care representative will contact you shortly to see if we can resolve your issue.